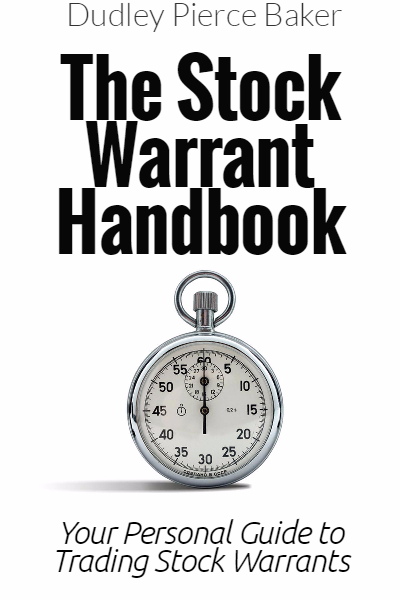 ← How Many Stock Warrants Are Trading? We start with the premise that warrants are a secret as so few investors know about the potential benefits via the additional leverage that warrants can offer. Did you know that virtually every company has some outstanding warrants in their capital structure? Simply, a warrant is a security giving the holder the right, but not the obligation, to purchase the underlying security at a specific price and expiring on a specific day in the future. Since the 1920s warrants have been issued in connection with initial public offerings and financing arrangements in which investors or the acquiring companies are seeking more leverage and thus warrants are viewed as an ‘equity kicker’ in those transactions. A call option would be defined very similar, except an option would be created/written by an investor where as a warrant originates from the company and the options will always have much shorter lives, usually 90 days to 1 year. The warrants of most companies were issued in connection with a private placement and thus will never trade. Yes, a few investors will have the financial ability and legal opportunity to participate in a private placement in the resource sector but those offerings by U.S. companies outside of the resource sector give little opportunity for investment. Savvy investors like Rick Rule and Warren Buffett would never participate in a private placement without receiving warrants with at least two (2) years before expiration and many times substantially longer. Few investors are aware of the fact that today there are 183 stock warrants which are trading on the Toronto Exchange, Venture Exchange as well as on the NYSE and Nasdaq. These trading stock warrants are bought and sold just like buying or selling common shares and is done through your regular brokerage firm. From our view, the standard was set by Sidney Fried in his 1950s thru 1970s service, “The RHM Warrant Survey” and his many books written on the subject, all of which we own and have studied for many years. 1. Find a company you like. This is perhaps the most important factor because if the company does not perform and execute on its business plan the common shares will not rise. Investors now have many opportunities with stock warrants in the resource sector as well as in other sectors, for example, gaming, banking and financial services, autos, oil & gas, biotech, pipelines and more. Of equal importance is the current market environment, that is, a bull market or a bear market. Currently in the United States the equity markets are on fire with the Dow and the S&P 500 near all time highs. In the resource sector the shares have been beaten down badly and offer great upside opportunity, in our opinion. Ultimately, you as the investor must make the decision as to which company and when to buy. 3. Does the company have a long term warrant trading? The longer the remaining life of a warrant the better giving the company more time to execute on their business plan and more time in the event of a market downturn. Your minimum time horizon should be no less than two years of remaining life when you purchase the warrants. Many of the warrants have over 3 years remaining and one of the most recently issued warrants does not expire until 2030. 4. The warrant should be priced to deliver an upside leverage of close to 2-to-1. Remember, investors are buying stock warrants for their additional leverage over the common shares, thus you should be looking for a minimum of a 2-to-1 return, meaning if the common shares increase 100%, the warrants should increase 200%. Perhaps the best way to explain stock warrants and their potential is via a couple of real examples, one in the auto sector Generals Motors (GM) and one in the resource sector, New Gold (NGD). Our examples are not intended to be recommendations to buy either the common shares or any of the warrants trading but only to show the math and the bottom line leverage potential. Also, we are not providing any fundamental analysis of either company. Generals Motors currently has two warrants trading on the NYSE and will soon have another warrant trading. We will focus our attention on the warrant B, which currently has the best leverage opportunities of the two trading. The warrant B has an exercise price of $18.33 and expires on 10 July 2019. Our detailed leverage calculations (not show) reveals with GM trading anywhere from $45 to $60, that the warrant B would be producing an up side leverage of between 1.7 to 1.8 which is good. Our interpretation is the price of GM warrants B is fair to under valued and represents good upside leverage. New Gold is a Canadian gold company that trades on the NYSE and on the Toronto Exchange. They have diversified production from several countries and northward of $500 million cash on hand. When the resource sector returns NGD will be a good selection. We have started our calculations on the New Gold Wt A (NGDAF) assuming a minimum price on the common of $20. The warrants expire on 28-Jun-2017 and have an exercise price of $15. If the shares are trading below $15 on the expiration date, the warrants will expire worthless. Our detailed leverage calculations (again, not show) reflect with NGD trading in the middle $20’s and above that the warrant will generate an upside leverage of well over 2 to 1 which is excellent. Our interpretation here is somewhat biased as we own the New Gold Wt A and look forward to a recovery in the resource sector starting soon. We are cautiously optimistic that these warrants will be a good performer well before the expiration date. Risk is always a factor in investing and one should remember that while warrants can offer exceptional upside leverage over the common shares, the warrants can expire worthless. If the common shares are selling below the exercise price on the date of expiration, the warrants are worthless. If the company’s common shares and are not performing well, one would be advised to sell the stock warrants just as you would sell the common shares well in advance of the expiration date. It always makes sense to minimize your losses with any investment and stock warrants are no different.